We decided those yummy Girl Scout Thin Mint cookies would be a perfect addition to some cookie bark along with milk chocolate and pretzels. If you don’t know any Girl Scouts those mint Oreos would work great too and the green filling would be a nice added touch. Since I haven’t seen any St. Patrick’s Day candy corn around I used green M & M’s instead. I had picked up one of those packages of all green “love” M & M’s they have out at Valentine’s but you could use a regular bag and just pick out the green and brown ones. I also picked up a bottle of Shamrock sprinkles at the craft store. 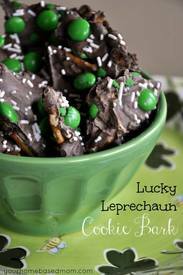 Combine all those ingredients together and you get Lucky Leprechaun Cookie Bark! !